I am thrilled when I find a book that gives me words to explain concepts I have already begun to experience directly for myself. 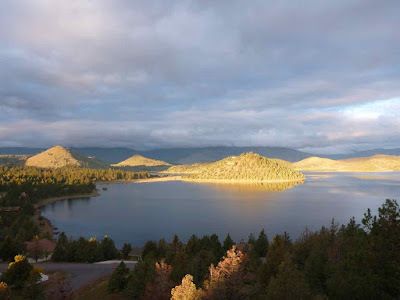 It feels perfect to have started reading it at Wesak, while under the expansive influence of the sacred mountain and observing the five elements - earth, air, fire, water, and space - dance together here at Lake Shastina. The author shares shamanistic concepts from the Tibetan Bön about how the five elements of earth, water, fire and air are accessed through the raw powers of nature and through non-physical beings associated with the natural world. 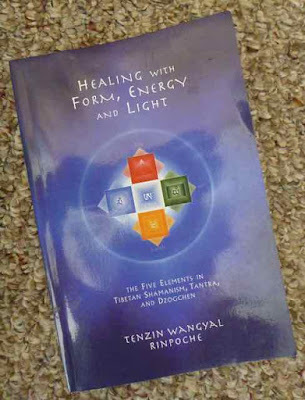 In the Tibetan tantric view, the elements are recognized a five kinds of energy in the body and he explains how to use them to balance oneself moment-to-moment. In the highest teachings, Dzogchen, the elements are understood to be the radiance of being that are accessed through pure awareness. The author's purpose in writing this book is to strengthen our connection to the sacred aspect of the natural world. "This is a manual for replacing an anxious narrow, uncomfortable identity with one that is expansive, peaceful, and capable. And the world, too, is transformed from dead matter and blind processes into a sacred landscape filled with an infinite variety of living forces and beings." I love reading this book because the author's way of writing is very clear and direct and easy to understand. I highly recommend it to anyone who feels the call to read it!! !